Another food I couldn’t find? Escarole. I checked all over the lettuce and vegetables areas, but couldn’t find it. I keep looking just to see if maybe it is only in stock certain times of the year? Anyway, I had to use spinach instead. I decided to keep it easy and do baby spinach since it is both easier to cook and easier for the Fudgelet to eat. This was a nice soup that was both warming, but not heavy. It reminded me of some soups my mom used to make growing up. 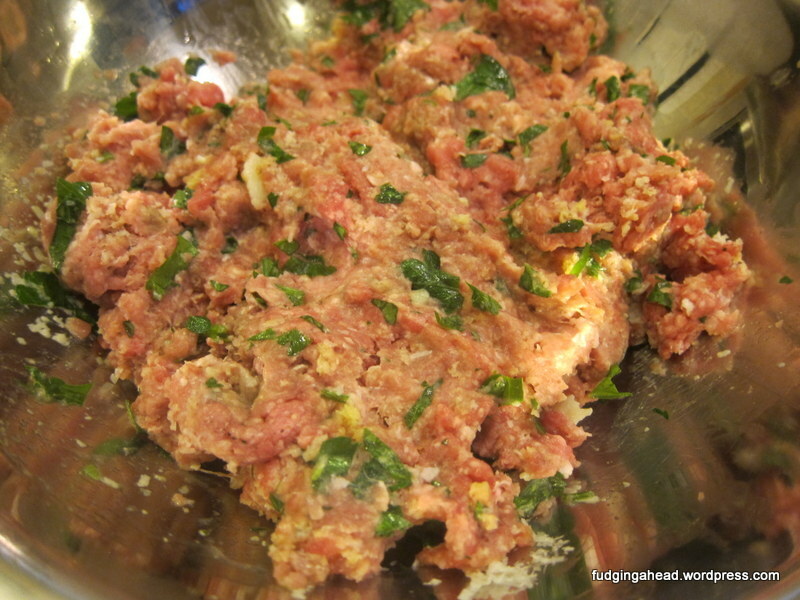 In a large bowl, mix together the ground turkey, ground beef, 1/3 cup parsley, 1 egg, garlic, breadcrumbs, 1/2 cup Parmesan, and a bit of salt and pepper. 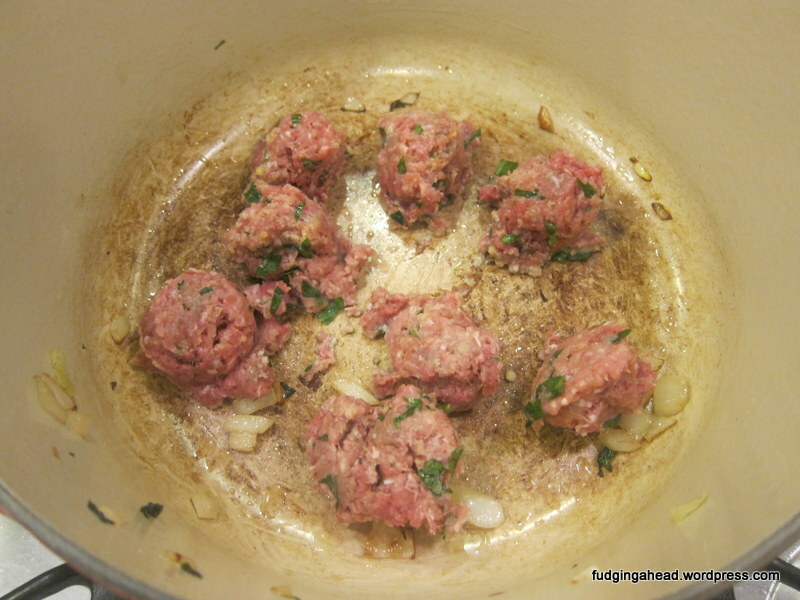 Then, form small meatballs and set aside. 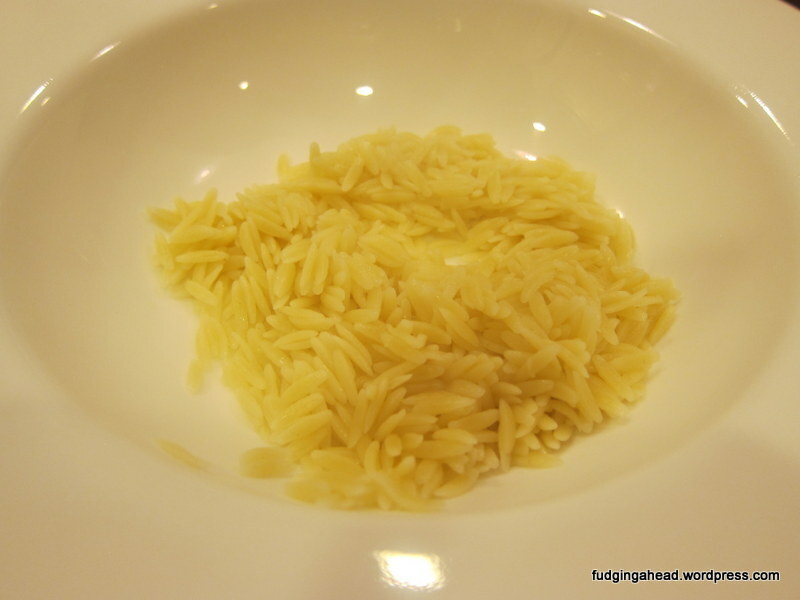 If desired, you can make them ahead and chill them in the refrigerator until ready to use them. Have your pasta ready to cook. 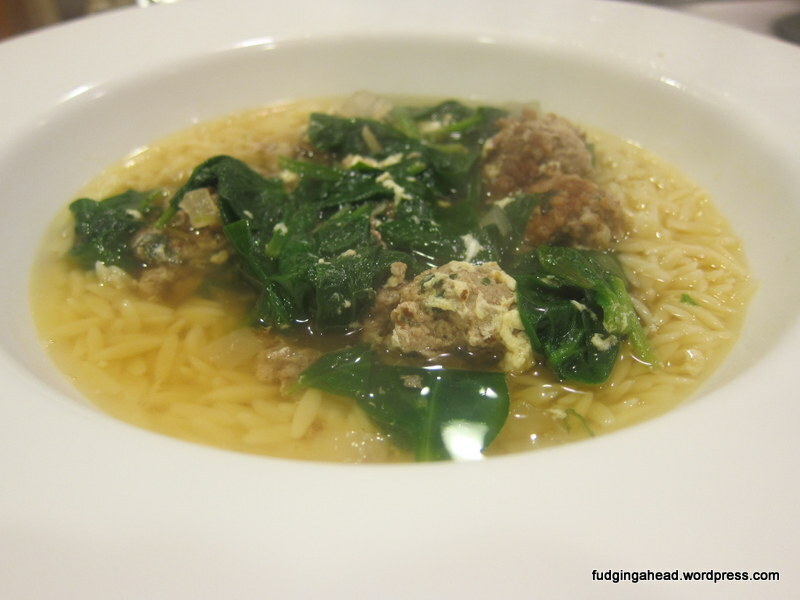 Bring your water to a boil and start cooking the pasta while the meatballs boil (see below). Drain and set aside. In a large pot, begin by heating some oil and sauteing the chopped onion until softened and it becomes a light golden color. Remove from the pan and set aside. Brown the meatballs in batches, not cooking them through. 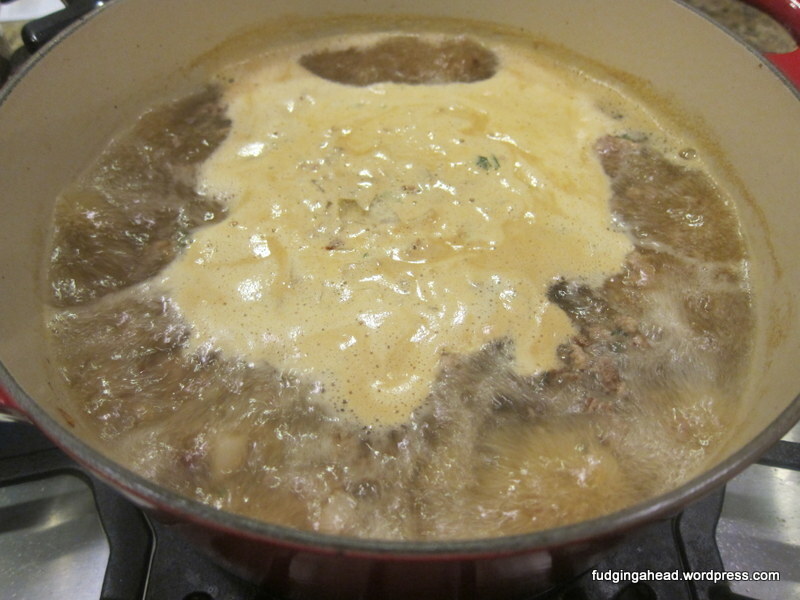 Add the chicken broth, along with the water, and bring to a simmer. While simmering, you might want to gently scoop out some of the “scum” on top. It’s not necessary but makes for a prettier, cleaner-tasting soup. 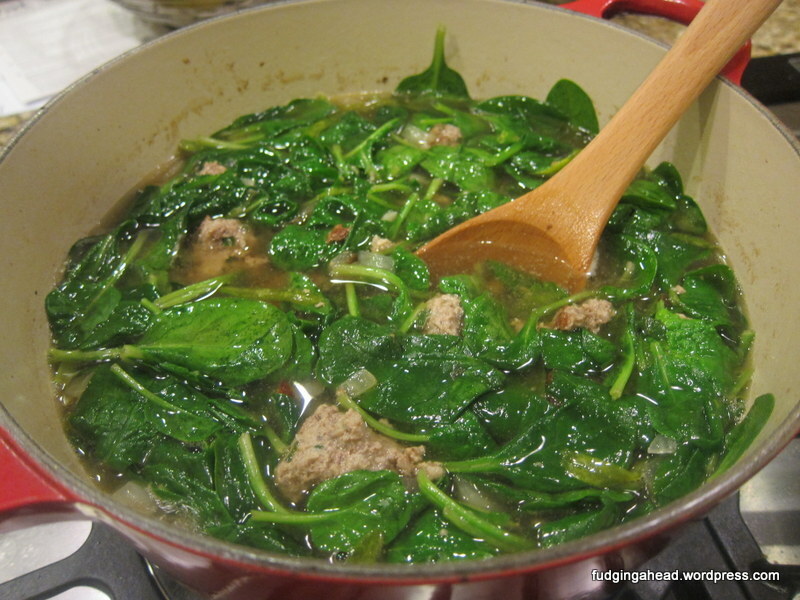 If using escarole or other lettuce, simmer until tender. 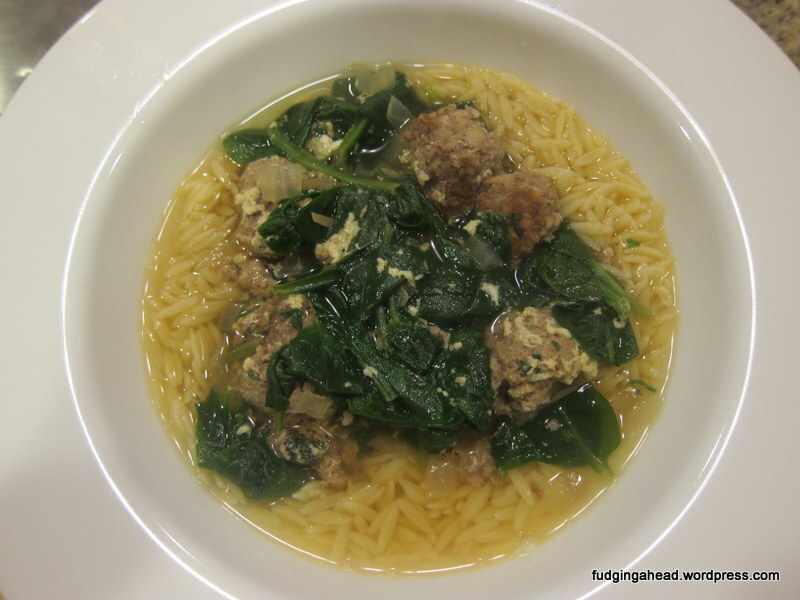 Otherwise, wait until the meatballs are cooked through, then add the spinach for a couple minutes to become wilted. 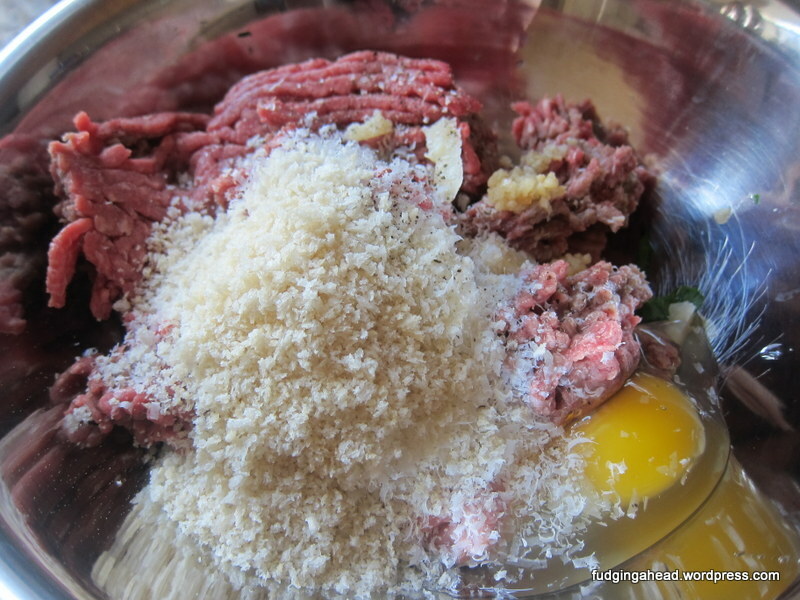 While the spinach cooks, whisk together (in a small bowl) the remaining 2 eggs and parmesan cheese. 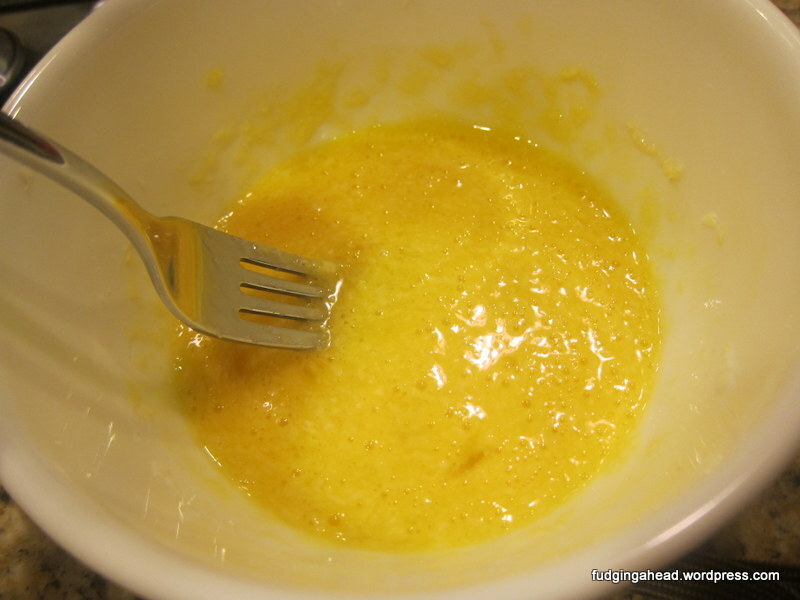 Add the onions and remaining parsley to the pot, then begin stirring the soup with a gentle motion and drizzle the egg/cheese mixture into the soup, creating egg strands. Taste the soup and add more salt or pepper if necessary. When ready to serve, scoop some pasta into a bowl and pour the soup on top. 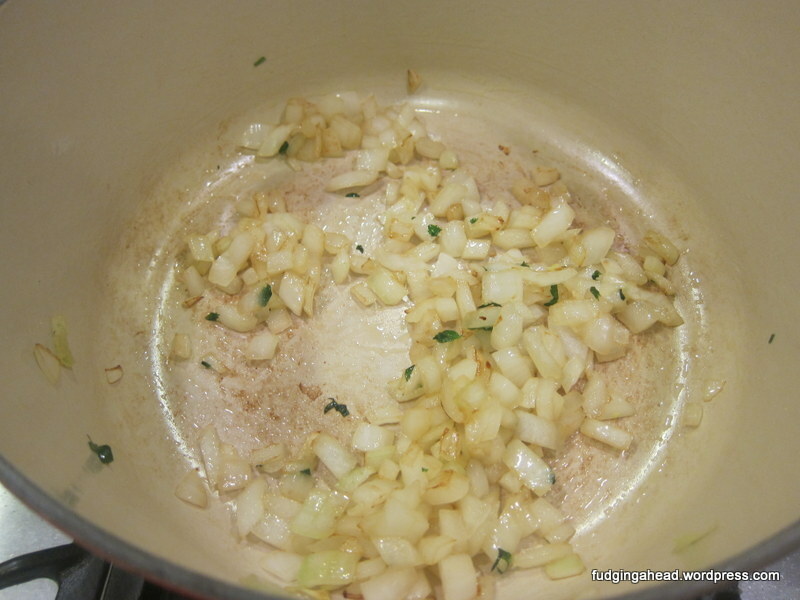 In a large pot, begin by heating some oil and sauteing the chopped onion until softened and it becomes a light golden color. Remove from the pan and set aside. Brown the meatballs in batches, not cooking them through. Add the chicken broth, along with the water, and bring to a simmer. While simmering, you might want to gently scoop out some of the “scum” on top. It’s not necessary but makes for a prettier, cleaner-tasting soup. If using escarole or other lettuce, simmer until tender. Otherwise, wait until the meatballs are cooked through, then add the spinach for a couple minutes to become wilted. 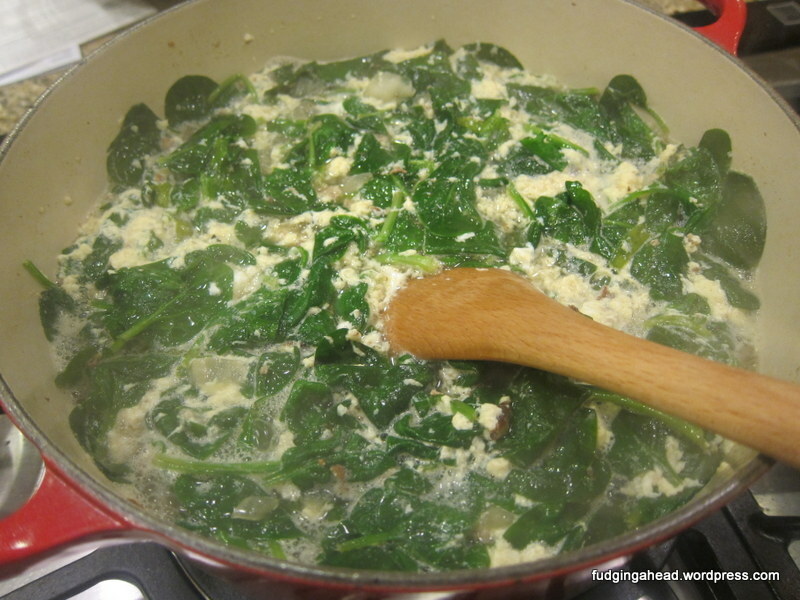 While the spinach cooks, whisk together (in a small bowl) the remaining 2 eggs and parmesan cheese. Add the onions and remaining parsley to the pot, then begin stirring the soup with a gentle motion and drizzle the egg/cheese mixture into the soup, creating egg strands. Taste the soup and add more salt or pepper if necessary.